You think I jest? This home has absolutely everything you have been looking for. Let's start with a quiet, street less than two blocks to the ocean, with great ocean breezes. Imagine a huge lot, big enough for that pool you always wanted. Like to landscape...this is the lot for you. Don't want to work on your yard...no problem. The work has been done for you already in the backyard with a grassy area. Lounge in the sun! Wake up on your very private, beautifully landscaped patio. Want to have friends over? Imagine them sitting around your outside kitchen with bar area! The property has a security fence and alarm system. There is a full 9x27 meter included to either add on to your yard or keep as a future location for a new home. This makes the entire parcel 486m2. All this before you ever step into this home that has been completely remodeled from the cosmetic to the plumbing and electric! This kitchen will knock your socks off! There is NOTHING else you would want in this kitchen. Even if you don't cook...you will in this kitchen. Trust me. I absolutely love the open feeling of this kitchen from the big front window, through the tons of countertop and cabinet space. There is even a dishwasher...almost unheard of in Ecuador. The seller did a remarkable job with lighting also. This just may be the most inviting kitchen you have ever seen. The breakfast bar is perfect for a couple of people. When you want to entertain everyone else...the dining room table is huge. You know how everyone always ends up in the kitchen? Well...here they can sit in the dining room or family room and still feel a part of the kitchen. Walk up the wonderful wooden staircase to the second floor. The master bedroom has a large walk in closet. It also has a wonderful master bathroom complete with a great shower with multiple sprayers. The guest bathroom is great for the other two bedrooms. The laundry room is located on the second floor and fits a full size washer and dryer. The second bedroom has its own balcony with views to the ocean. This home comes with some appliances and furniture. 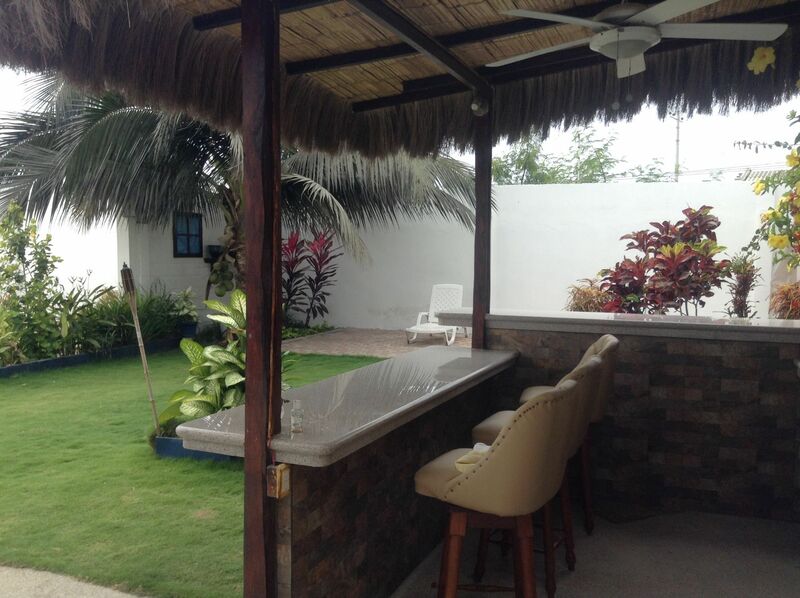 For a private viewing of this property, please contact Lourdes Guzman at 099.449.5658 in Ecuador. You can also reach her at Lourdes@ieiecuador.net.